This course is equivalent to three A levels and is ideal for those who have a passion for all aspects of sport, coaching and development. It would particularly suit students who are likely to go on to study at higher education or work in the sports and leisure industry. The qualification covers a diverse range of areas within sport. BA (Hons) in Sports Studies and Development, which could lead to employment as a sports development officer for a National Governing Body or County Sports Partnership. Courses such as Psychology, Sociology and Biology particularly complement studies in the Extended Diploma in Sport. Students complete three externally assessed units: Development and Provision of Sport and Physical Activity: Fitness Training and Programming for Health, Sport and Well-being; Anatomy and Physiology. Students complete five internally assessed mandatory units: Professional Development in the Sports Industry; Sports Leadership; Application of Fitness Testing; Sports Psychology; Research Methods in Sport. Organisation; Exercise and Circuit- based Physical Activity; Sports Injury Management; Coaching and Leading for Participation; Physical Education and the Care of Young People. Minimum grade C in GCSE PE, if taken. 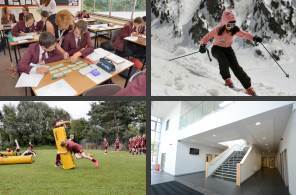 Although GCSE Physical Education is not required, a keen interest in a wide range of sporting areas is essential. Edexcel BTEC Level 3 Extended Diploma in Sport and Physical Activity Development.